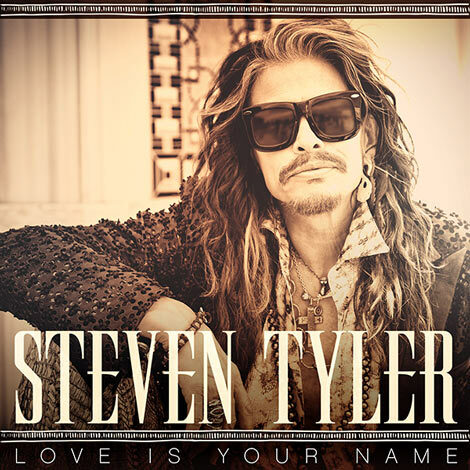 NASHVILLE, TN (May 12, 2015) – Iconic songwriter and prolific singer STEVEN TYLER will debut his first Country single “Love Is Your Name” on May 13. Tyler, who was recently signed to Dot Records underneath the Big Machine Label Group umbrella (Taylor Swift, Tim McGraw), will release the single across multiple media properties with exclusive interviews and a LIVE televised performance. On Wednesday, May 13, iHeartMedia will host a World Premiere of “Love Is Your Name” across more than 120 mainstream Country stations nationwide. Additionally, Tyler will interview live on the air with iHeartMedia’s nationally-syndicated Country music personality Bobby Bones where he will talk about the song and his adventures in Nashville. The award-winning Bobby Bones Show is heard on more than 80 radio stations across the country and nationally through the iHeartRadio digital service. On May 13, Tyler will sit down for an exclusive interview with host Nancy O’Dell for an interview airing on both the #1 rated, syndicated entertainment newsmagazine show Entertainment Tonight (check local listings), and CBS This Morning. Tyler is considered one of music’s most recognizable and dynamic frontmen and has been cited by Rolling Stone as “one of the greatest singers of all time.” Tyler and Aerosmith have sold more than 150 million records worldwide, he has won four Grammy Awards, six American Music Awards, four Billboard Music Awards, and an Emmy Award. In addition to having nine #1 hits, 25 gold, 18 platinum and 12 multi-platinum album certifications, Tyler, along with the rest of his band members were inducted into the Rock & Roll Hall of Fame in 2001. In 2013, Tyler was awarded with the Founder’s Award at the ASCAP Pop Awards and was inducted into the Songwriter’s Hall of Fame. For the latest updates, follow Steven on Twitter or visit StevenTyler.com.